Eat, Pray and Love, the movie comes to mind when Bali is mentioned. It is a 2006 memoir written by author Elizabeth Gilberts about a one woman’s search for everything across Italy, India and Indonesia. It starred Julia Roberts and was filmed in Bali. I think it’s fair to say the movie brought fame and made Bali a popular tourist destination. Bali is the 3rd destination of our 3 week Tour of Asia from Los Angeles with 1st stop in Japan, then Hong Kong and now, to Bali island of Indonesia. We stayed from Oct. 15 – Oct. 18, 2015. We arrived in Denpasar Int’l airport at 3:30pm when bulk of flights arrive. The arrival of big crowd at the same time results in long lines to get a VOA (Visa on Arrival, cost $25 US) and long waiting time to get through immigration. It took us over an hour and a half. There are taxis outside (fixed rate depending on destination) readily available for transport to your hotel. I arranged our tour with Driver’s With Distinction online, and selected Surya to be our driver/guide for the next 3 days. He is personable, spoke good English and has an infectious laugh. He was very prompt, always on time or even early at times. Very satisfied with his service and highly recommend. 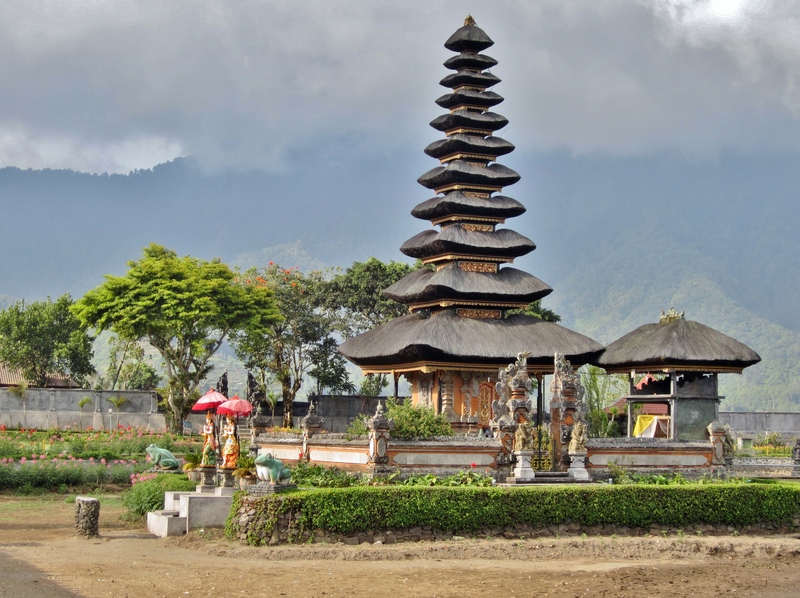 Bali offers so many temples and attractions so it’s wise to pick which ones your time will allow. I communicated ahead of time ahead of time with Surya which sites to include in our itinerary, where we’d like to eat and where to shop. Listed below are the attractions and sites we visited during our trip. 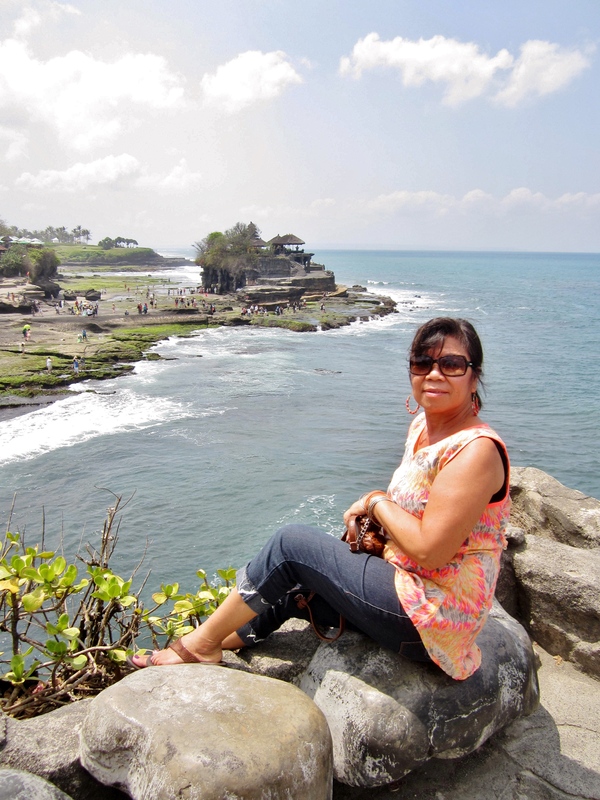 Must see: Pura Ulun Danum, Penglipuran Village, Tanah Lot Temple View, Tirta Emple (Water Temple). View of Tanah Lot from the distance. 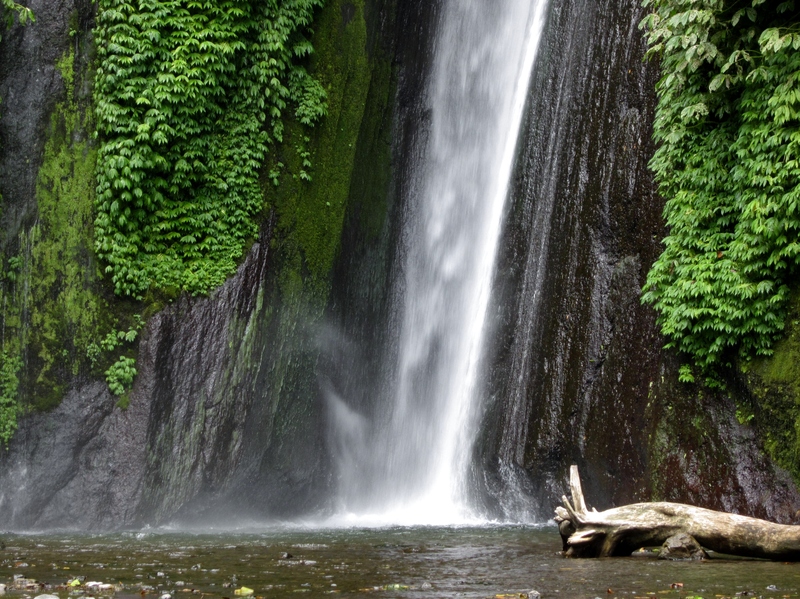 If you have more time: Mundok waterfall, Jatiluwih, Kintamani & Volcano, Mt Batuk & Lake Bratan, Uluwatu (a very long drive and not much to see, you can skip). 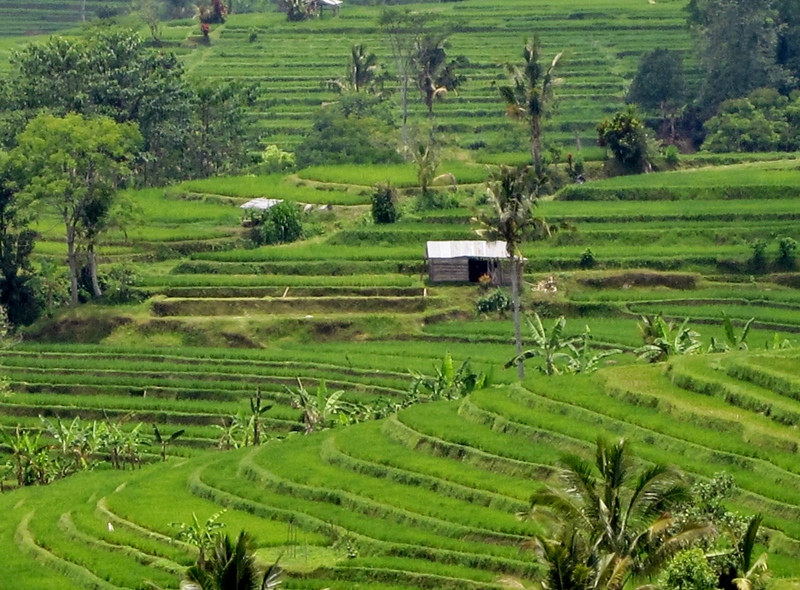 Jetiluwih Rice Terrace, the best looking of 3 rice terraces in Bali. We stayed at 3 different hotel locations during our trip: 1 night in Sanur, 2 nights in Ubud and 1 night in Nusa Dua and for good reasons. I wanted to use our time efficiently, minimized driving back and forth had we based our stay in one place. 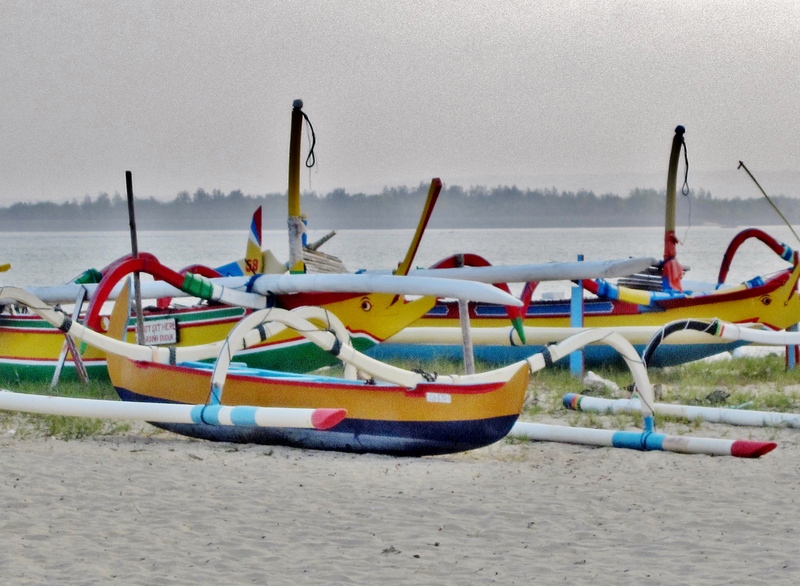 Our trip covered the south (Sanur), to the north (Bedagul), to central part of Bali (Ubud). then back towards south (Nusa Dua), and got us closer to Denpasar airport for our flight departure. Our suite cost $90 US per night breakfast included. TIP: I booked direct at their website, and got free two 15 min foot massage. . Entrance to our suite in Kamuela. One of the friendly staff of the hotel. An unusual fruit sitting on a tray caught my eye as we entered our suite. 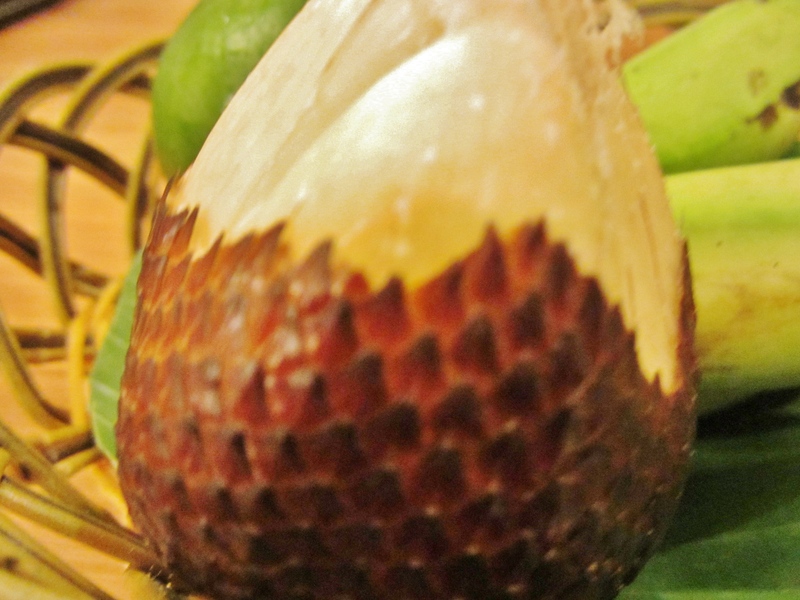 Shaped like a pear, with a skin like that of a snake, this fruit is known as Salak, commonly called the snake fruit, a species of palm tree family native to Indonesia & Malaysia. 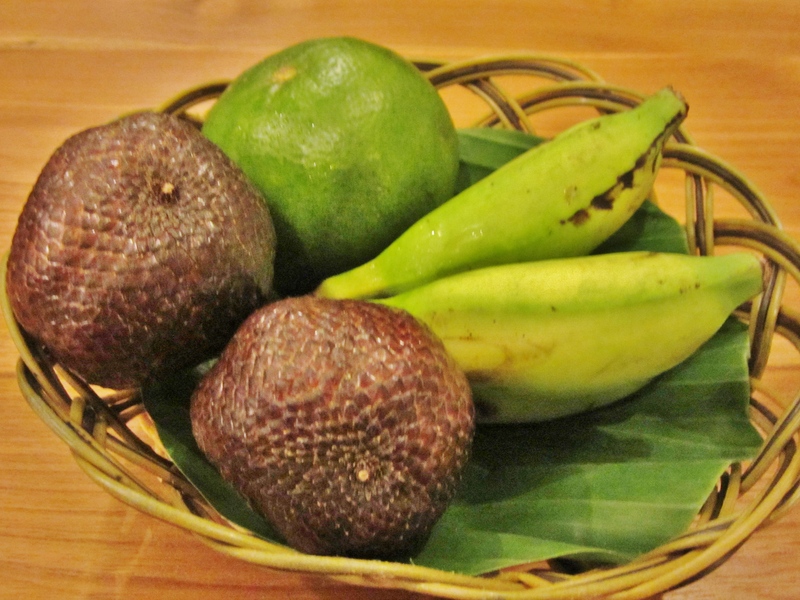 The Salak or snake fruit common in SE Asia. It’s sweet, crunchy and taste like a crossed between jackfruit and durian (tropical fruits commonly found in SE Asia). 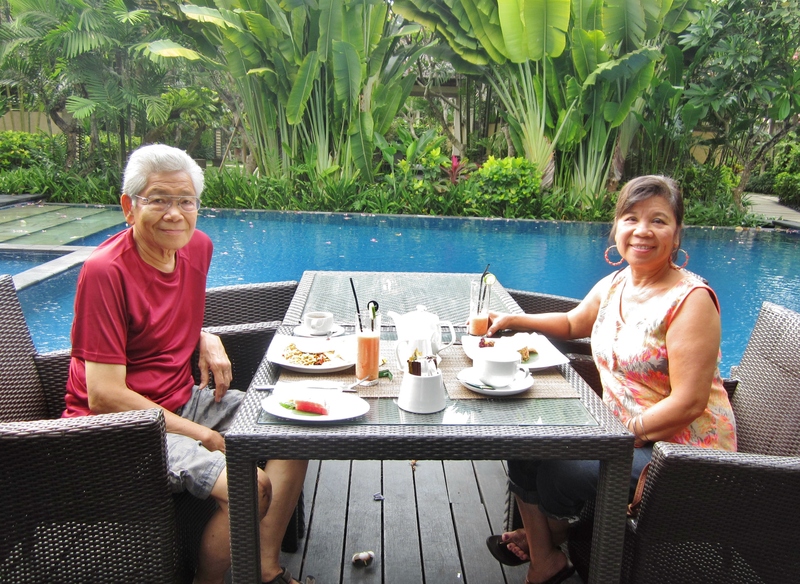 Breakfast is served by the pool, which is surrounded by lush tropical plants and include freshly squeezed juice, sliced fruits and made to order breakfast entrée’s. The pool at Kamuela Hotel. 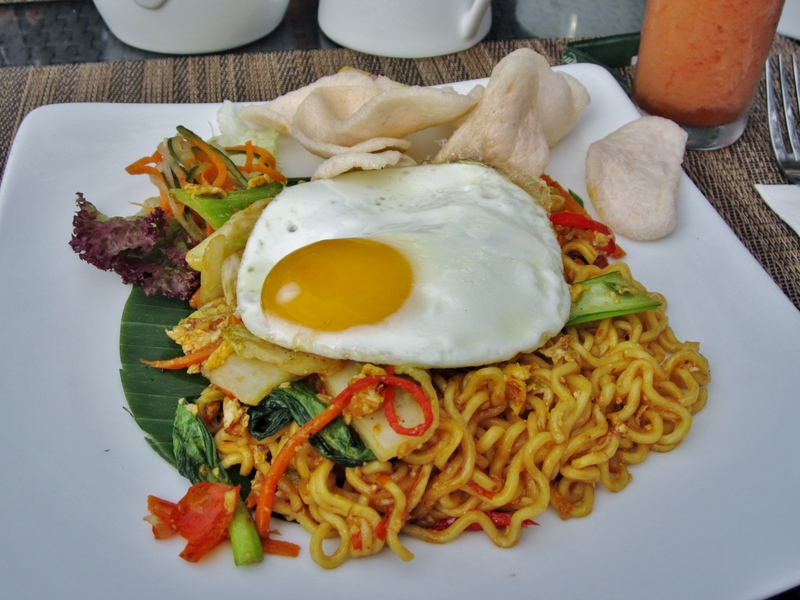 Mee Goreng, a typical Indonesian dish. 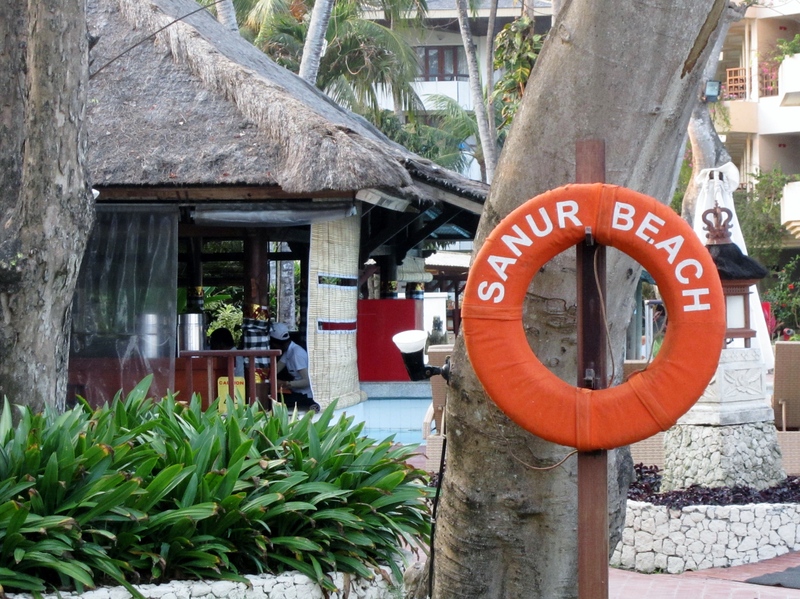 Sanur Beach: Walked along the beach to find Kembasa to have seafood dinner, but had no luck. 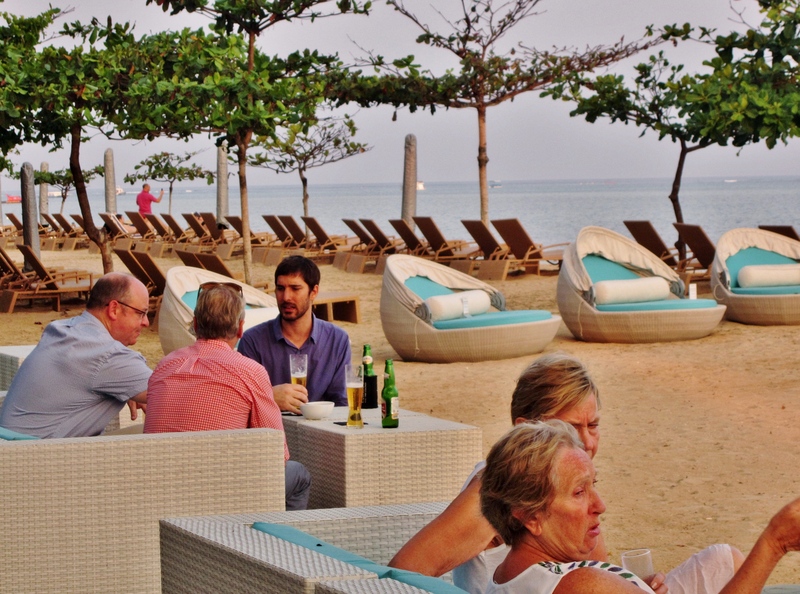 Lounge set up by one of the hotels along the Sanur beach. I rate this hotel a perfect score of 10. 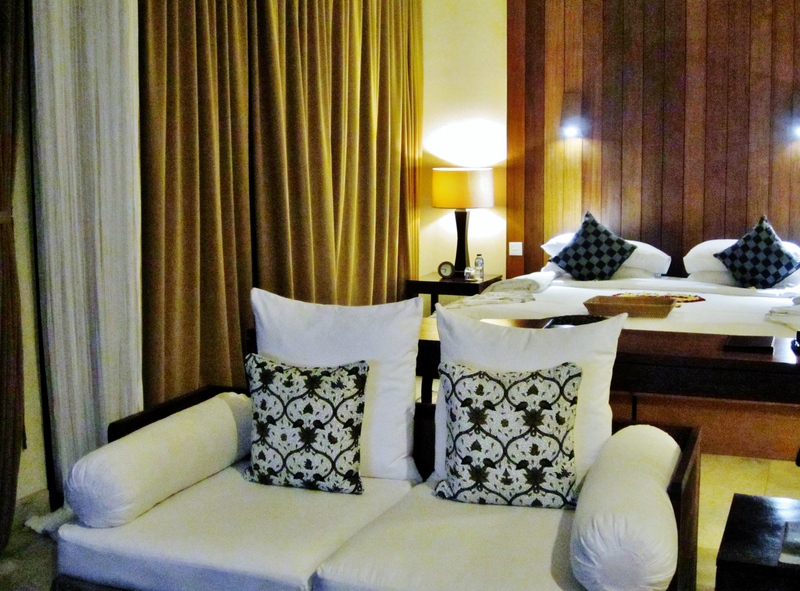 A beautiful and luxurious suite, coupled with excellent service and hospitality. Staff anticipated our needs without asking, courteous and friendly. They called us by our names, and never failed to say hello, have a nice day or asked how was your day. They even gave us parting gifts at the end of our stay, how sweet. Our suite at Komaneka Bisma in Ubud. Komaneka at Bisma Hotel in Ubud. One other hotel stay that blew our mind. Luxury and great service all around. St. Regis pool villa suite #107. 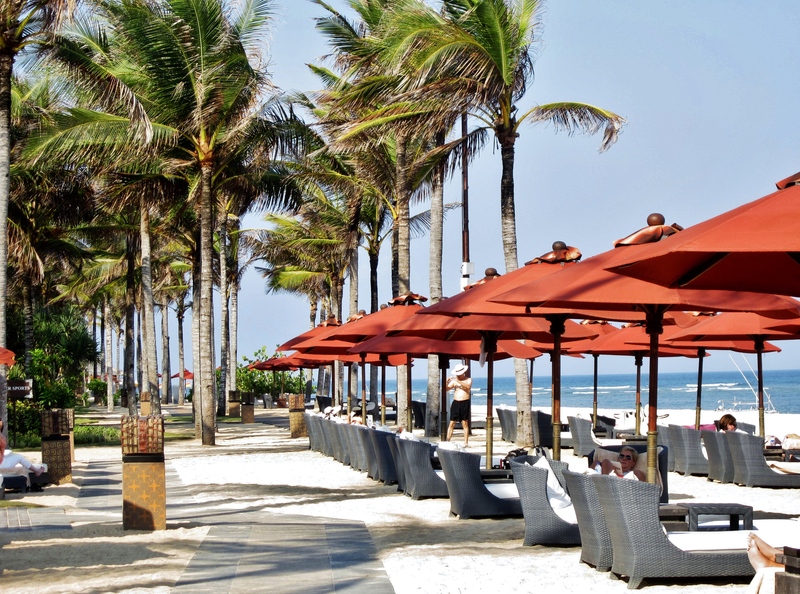 St. Regis Bali Resort secluded beach in Nusa Dua. We consider ourselves foodies, and love to eat anything good, exotic flavors, local foods, simple, gourmet and extravagant. Bali offered us all those. I don’t think we had any bad meals. Definitely unique and out of this world, non-stop offerings of gourmet food. You are given 3 hours to eat from the menu and food trays passed around constantly. Food coma for sure. Expensive but definitely worth every penny. Here’s the link for the blog already posted, http://wp.me/p2jCGg-xA. 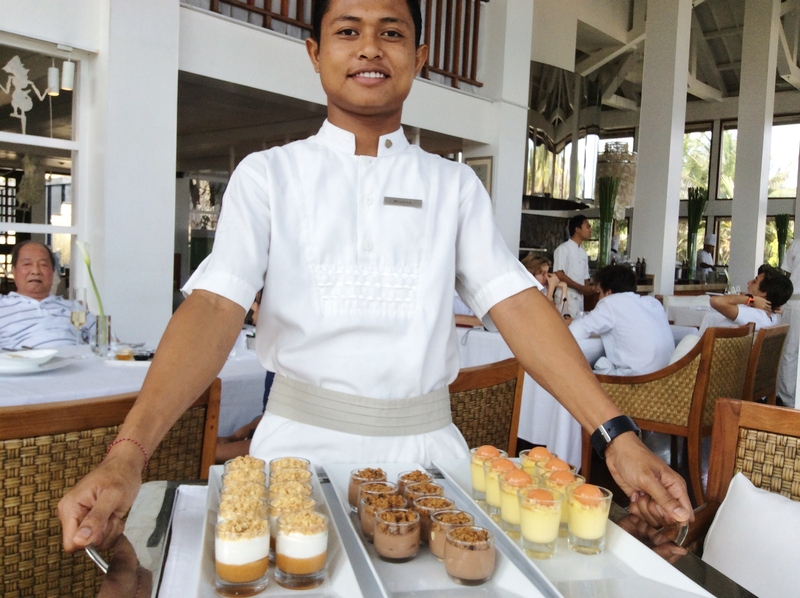 Kayuputi Platinum Brunch at St. Regis Bali. A specialty dish all over Bali, with every place claiming they have the best roasted suckling pig. We went to Ibu Oka in Ubud, and Anthony Bourdain (a popular Food TV host) called it the best. Be sure to arrive early around 11:00am for lunch. They only prepare so much and once they’re gone, the place shut down. Every meal we ate here were very tasty, very good and always presented beautifully. 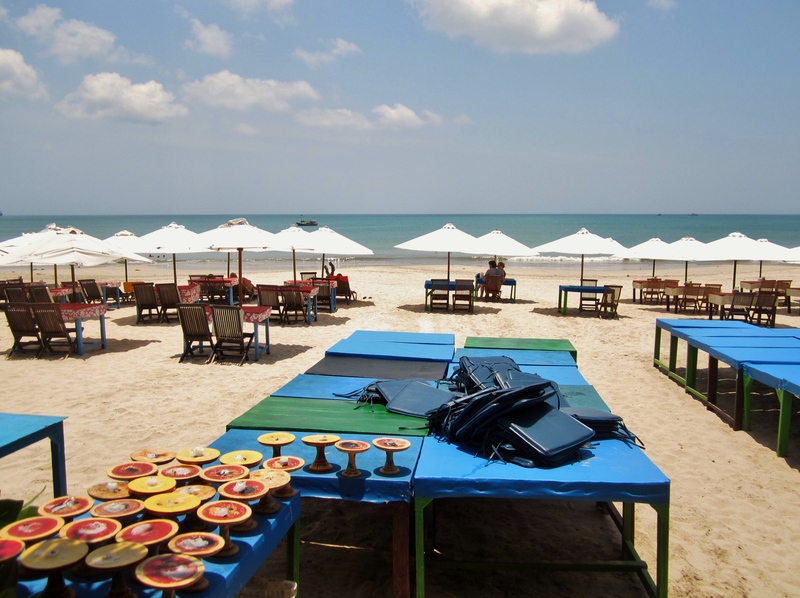 No visit to Bali is complete without going to Jimbaran for seafood. There are so many places to choose from. Read up on TripAdvisor for reviews and tips where to go. Sorry, can’t remember the name of the place we went for lunch. 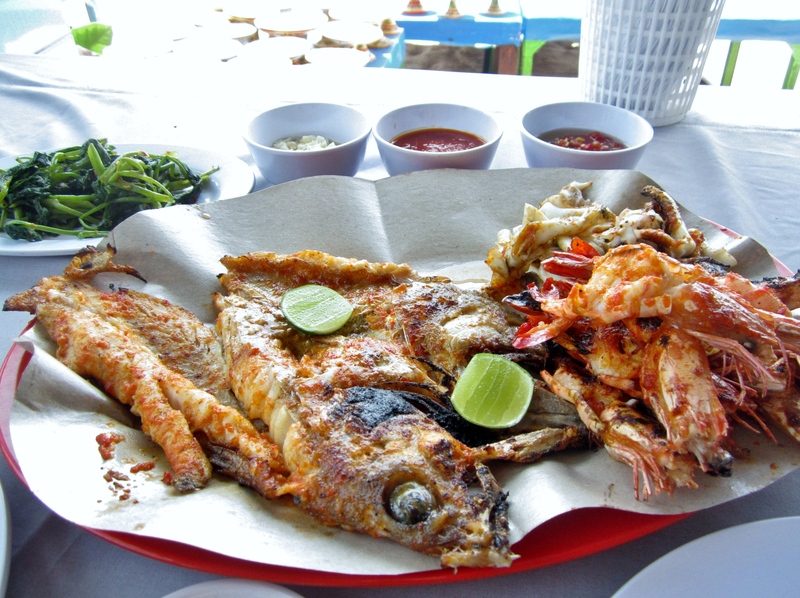 Fresh, delicious grilled fish, prawns , clams & calamari. 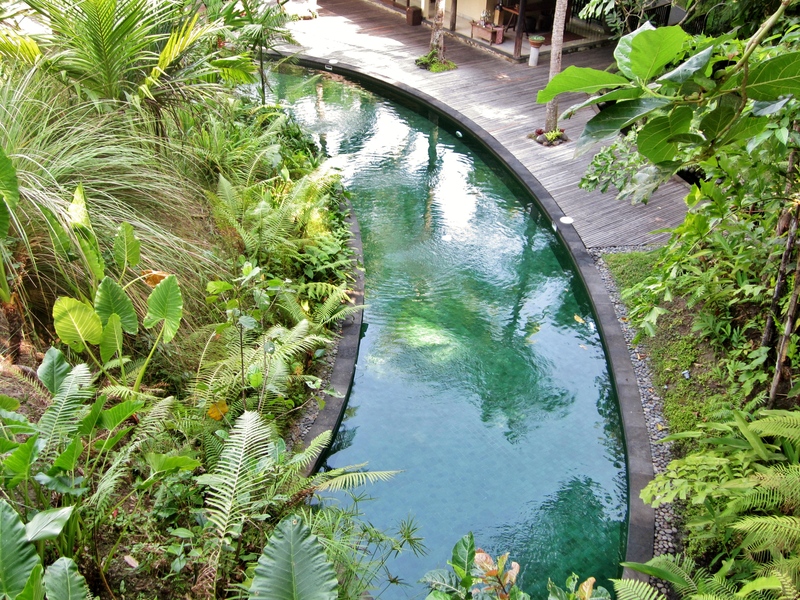 Bali is haven for spa lovers, we discovered. They are everywhere, and very inexpensive and you’d be a fool if you don’t take advantage like we did, almost everyday. 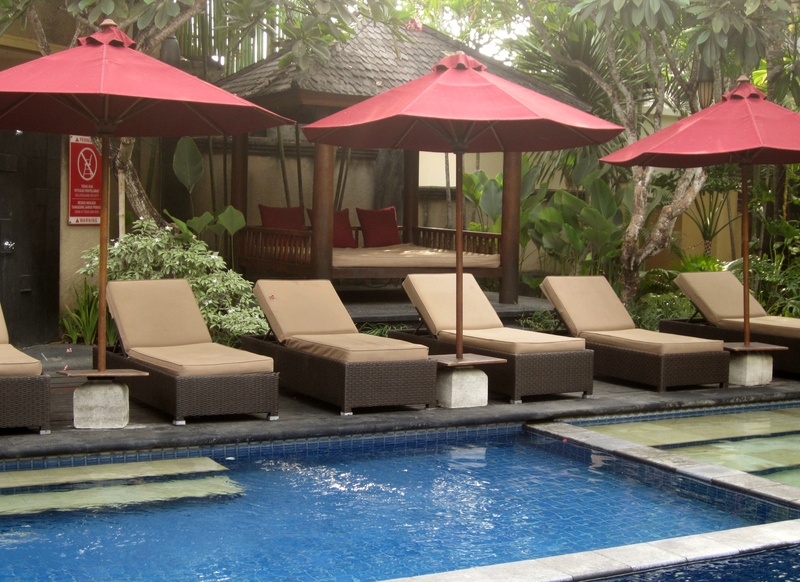 Kamuela Hotel Spa: A brief intro to what’s in store for us, spa experience during our stay in Bali. Received complimentary 15 min foot massage which was really good and would pay to have it again here. 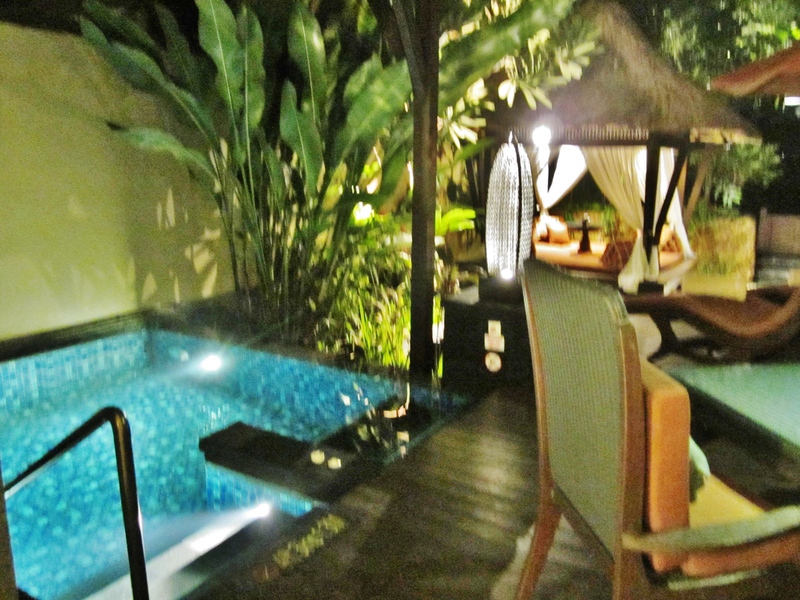 Leha LeHa Spa: We had our 1st initiation of our rituals of pampering while in Bali at this spa in Sanur, and received a 1 1/2 hour Balinese massage and 45 min body scrub. Perfect! 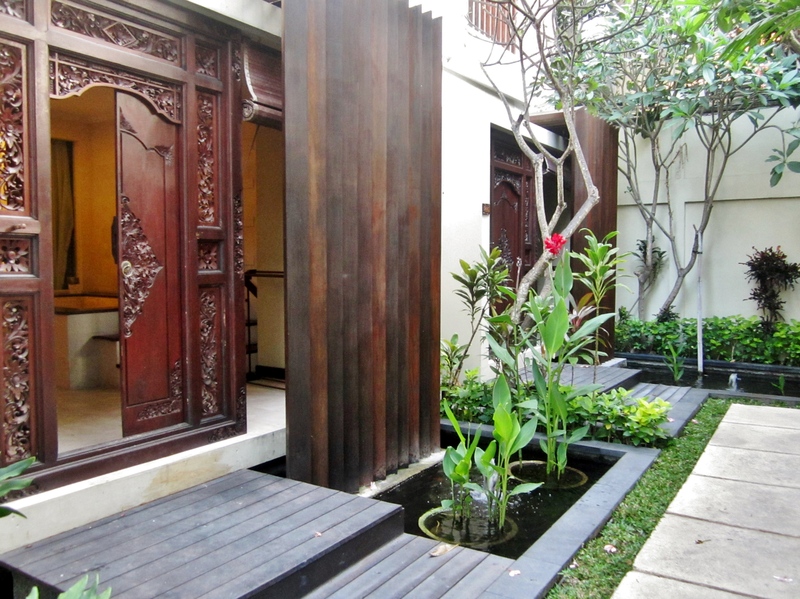 Komaneka at Bisma in Ubud Spa: As part of our hotel package, I received a one hour spa Balinese massage. A massage is always good, and this one was no exception. Hotels usually charged more, so I would rather go to independently-owned spa parlors for better priced and/or treatments. We love Bali and would like to return someday. Despite our short stay we managed to see and experience a great deal. There are so many details and wonderful photos, I wish to share. I think its best if I write separate blogs on sites/attractions/hotels that warrants comprehensive coverage. Here’s the link for my blog on Bali’s Attractions, with more photos and details. http://wp.me/p2jCGg-LE. Please visit my website, http://www.ramonadetravels.wordpress.com to find those upcoming blogs referred to here. You may also find blogs on other travel destinations for ideas and inspirations, as well as helpful tips. Thank you and please let me know what you think and write your comments and/or any questions. This entry was posted in Dining Experience, Hotel Review, Photography, Travel and tagged Baba Guling, Bali, balinese massage, Eat, Jimbaran seafood, Kamuela Suites and Villa Hotel, Komaneka at Bisma Hotel, Leha Leha Spa, Pray & Love, Salak, snake fruit, St Regis Bali Resort & Spa, Tanah Lot by Lena. Bookmark the permalink.